In this guide, we will help you decide if you need one. And if you do, we will take you through all the vital details you need to know to pick up the right chair for your bundle of joy to enjoy meals in. Do I Need a Highchair? Once your baby approaches the age of 6 months and starts moving onto semi-solid and then solid food, you will need to seat him/her somewhere during feeding times. Given that a baby is excited about practically everything around it, expect food to be flung around. Naturally, the little kid will also drop food until it learns to eat on its own. Now, a regular chair in the house would be too low and unsafe for your active babe. You may not want to indulge in this murky activity on your favourite couch. Moreover, you would need to strap in your child to keep her in place while she eats. The answer to all mealtimes, for the next two to three years, is a highchair. High, so that you don’t break your back feeding your little one. The next few sections will take you through what else a high chair is a blessing for. 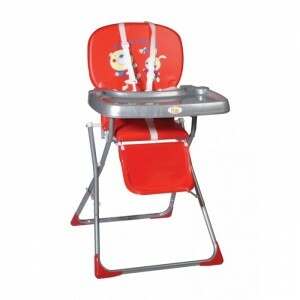 A basic highchair will come without tons of embellishments, but will serve its purpose well enough. They are likely to be made of molded plastic, with or without basic padding. Don’t expect features like reclining seats, height adjustments etc. They are basic, functional, lightweight and less expensive. These chairs come with almost all the features you could wish for. You can expect well-padded seats, detachable trays, adjustable height and seat recline, wheels, easy folding and storage. These chairs come in attractive designs and colours. They are more functional and sturdy than basic chairs, and are hence, also bracketed in a higher price range. These seats are designed to be strapped on to a regular chair in the house. They are well-padded and come with most features that you get in a full-featured chair. On the upside though, these seats can be transported easily and occupy less space in the house, as they can be easily stacked away when not in use. They also tend to be less expensive than regular highchairs. Here is a checklist of things you should think about while evaluating a highchair. 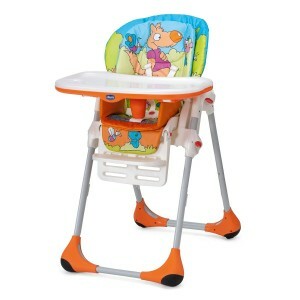 Is the highchair easy for you to operate with a kid in one hand? Can you put the baby in and pull it out with equal ease? Are the upholstery, tray and buckles easy to clean after your kid has merrily mucked it up? Can the height be adjusted? Will the user, that is the child, be comfortable in the seat? Does the highchair have sufficient padding? Is there a footrest? Remember babies grow fast. Will your kid have sufficient space while sitting inside the chair or will he feel cramped? Does the chair offer harnesses to strap the baby in safely? When folding, are there any parts that can pinch your child’s or your own fingers? Are there any crevices or sharp corners that could hurt your precious one? If it is a foldable chair, there should be a safety latch that you can put in place when it is in use, to prevent accidental folding while your tot is in the chair. How much space does the highchair occupy? Can it be easily folded and stored away? The model you choose will depend on the kind of space available in your kitchen/dining area. Assure yourself that the highchair won’t tip over easily, even if the child kicks around or throws a tantrum. While you look for a wide base, keep in mind that if it’s too broad, you or your older children may trip on its legs. You’ll probably use the highchair for 2-3 years and multiple times a day. Can the seat be adjusted to fit a growing baby? Can it convert to a toddler chair once your baby outgrows it? Some baby chairs can be converted to small chairs that can be used by the child as it grows older. Also keep an eye out for well-known brands, certifications and warranty. 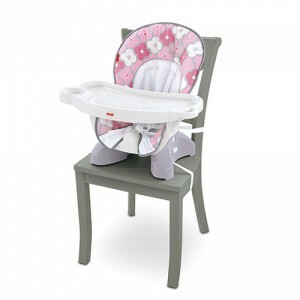 A highchair comes equipped with a great number of accessories. Here’s what you need to know about them. While these will surely make the chair cozy for the child, keep in mind that they will need regular cleaning. Look for padding in vinyl-like material that is easy to clean. Cotton tissue is more likely to pick up stains. Alternately, detachable padding that can be washed makes for a convenient option. Or pick up a chair with no padding (super-easy to clean), which is, however, ergonomically designed to support the baby’s back and neck. If you plan to bottle-feed your child on the chair or if baby tends to fall asleep soon after or during his meal, you may want a high chair with a back that reclines. Do make sure the footrest moves as well, so that the baby is comfortable in the lounging position. Some highchair may not have a tray at all. You can slip these in next to your regular dining table, so that the baby may join in with the rest of the family. If there is a tray, is it fixed or detachable? A detachable tray is undoubtedly, easier to take out and clean. Does the chair allow for the tray position to be adjusted closer to or farther from your child? This feature will help as your child grows. It is absolutely essential to harness the baby into the seat, because she won’t warn you before she learns to pull herself up on it! There are usually two types of harness: five-point harness and three-point harness. While the three-point harness is usually sufficient, a five-point is safer as it holds the baby in from the shoulders as well, thus ensuring it can’t pull itself up and stand. If it manages to do so, the chair is very likely to tip-over and cause an injury. This safety device must be present in addition to the harness, as it keeps the baby from slipping out of the chair from under the tray. If the highchair you are favouring comes with wheels, make sure that you are able to lock them when the baby is in, to avoid any accidents. Even if you’ve chosen to shop online for this item, you may benefit from trying your hand at your chosen model in a brick-and-mortar store. It helps to take your little one along as well, and see what it’s like to put the baby in, pull it out, buckle it in, fold the chair etc. Remember, you are going to operate this chair multiple times in a day, every day! It will pay to pick up a model that works for you. Kids learn fast and are smarter than we sometimes think. Ensure buckles, harnesses and trays cannot be easily detached by your toddler. Double-action latches are more difficult for the little one to figure out. And with that, you are all set to go highchair shopping!